The Omega Juice Cube. 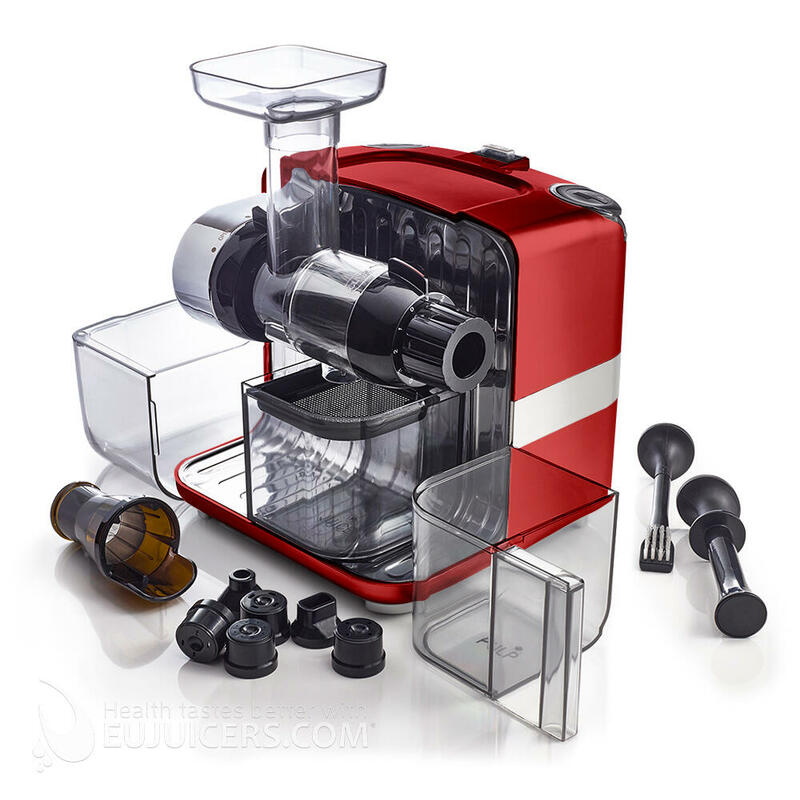 A powerful, low speed masticating juicer and nutrition system with a square footprint and cube form factor. Excellent counter top appeal and a compelling industrial design. With the versatility to create nut butters and baby food, work as a pasta and soy milk extruder, or even serve as a grinder for coffee beans and herbs, this Omega Juice Cube does so much more than extract fresh juice from fruits, vegetables and leafy greens! The Juice Cube features a dual stage masticating extraction for optimum yield. 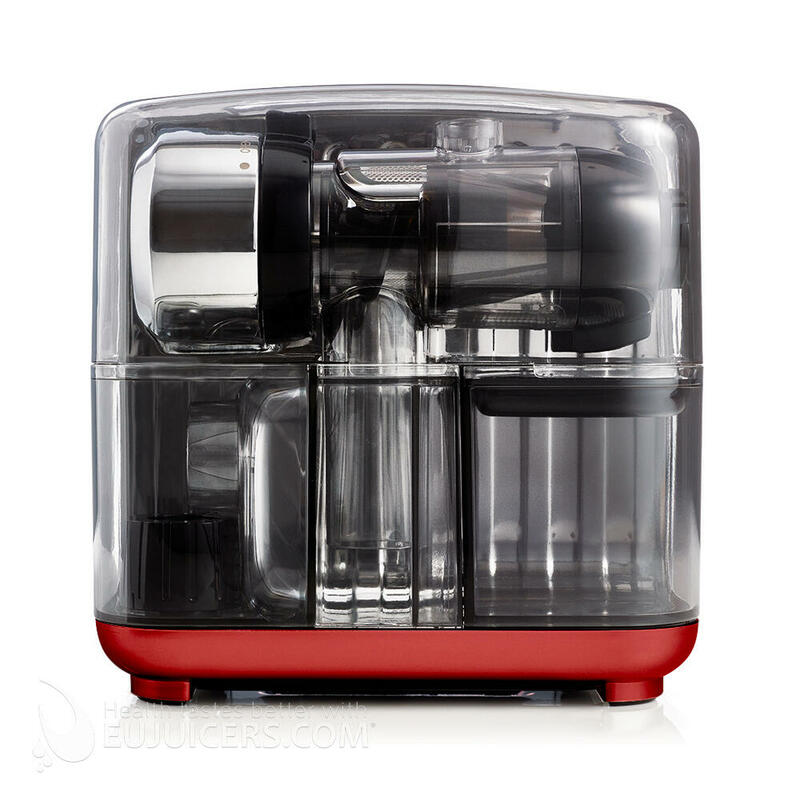 It automatically ejects pulp into a separate container for easy, continuous juicing. The Juice Cube operates at a low speed of 80 RPM, allowing this juicer to chew through plant fibers and penetrate membranes to extract the fullest taste and highest values of vitamins and minerals from foods such as wheatgrass, carrots, and more. Plus, it ensures less foaming and minimal heat rise for healthier, longer lasting juice. 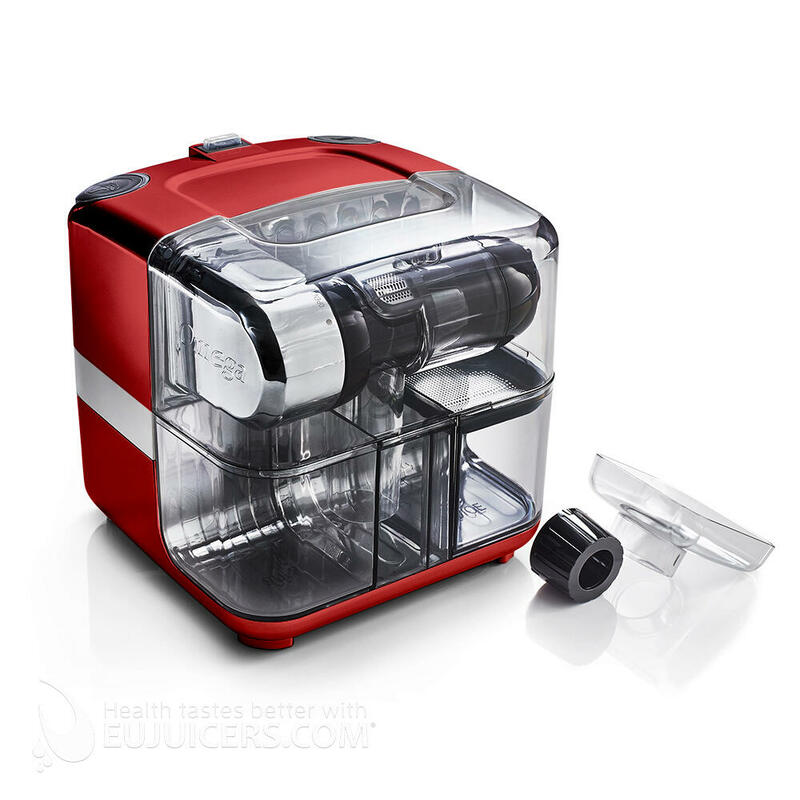 We were very interested to see Omega's new Juice Cube, to see if they succeeded in making the traditional horizontal juicer much more compact. In reality, it doesn't feel much smaller than a regular horizontal. That's because while it is four inches shorter than a normal horizontal, it is also four inches wider. However, the appeal here is really in the packaging of this juicer. All the parts - containers, strainers, nozzles, pushers, etc. - fit neatly into the Juice Cube when it is not in use. 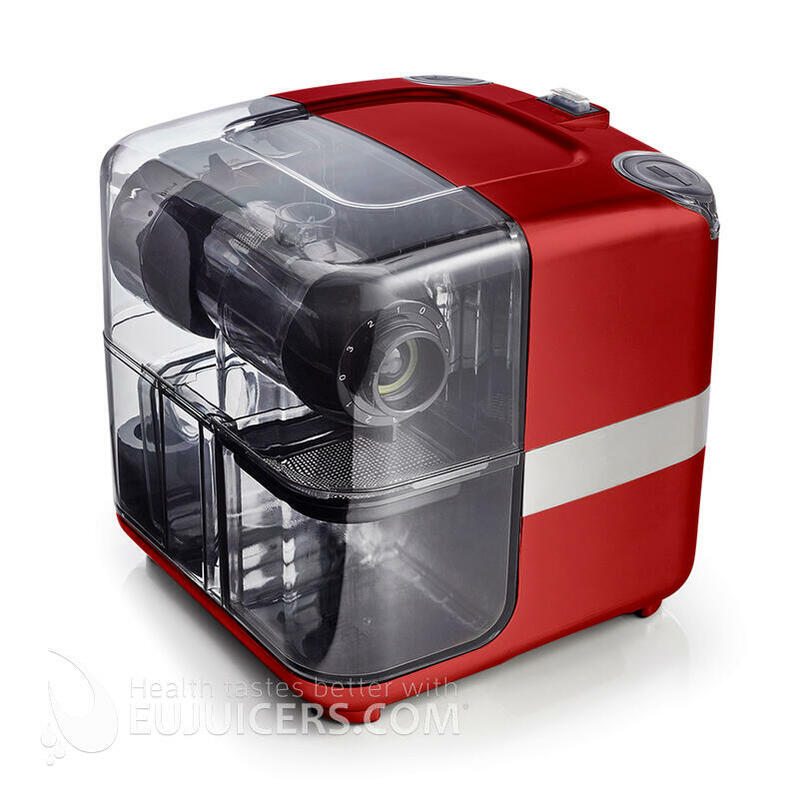 In terms of functionality, the Juice Cube offers the same 2 horsepower as Omega's other horizontals, although this comes from a 200W motor versus the 150W found in the NC series. We found the juice yield and quality to be very similar to other horizontals. 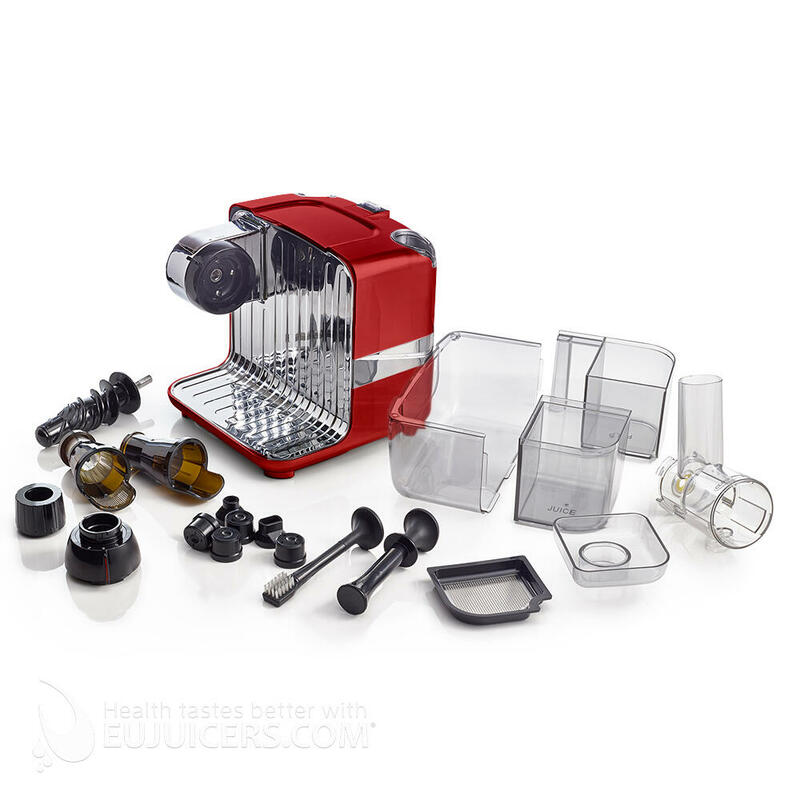 The biggest difference was that most of the parts such as the juice and pulp container, feeding tray, and pusher are noticeably smaller than in standard horizontal juicers. This is how they are able to fit into such a compact storage unit. Unfortunately it also makes juicing a bit less convenient versus using a full-sized pusher and feeding tray. We found the Juice Cube to be a mixed bag. The look is like nothing else on the market. It definitely stands out, and in a good way. It also is very clever in the way all the parts are stored inside of it. On the other hand, it's not quite as easy to use as a traditional horizontal because of some of the smaller parts. 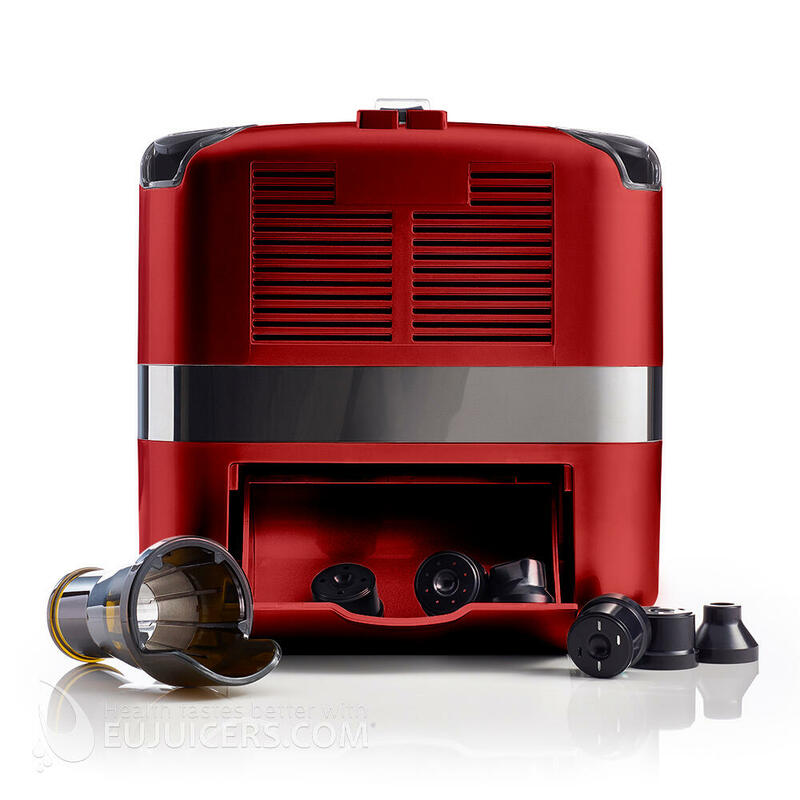 Overall, it is a quality juicer with some small compromises made for the sake of its form factor.